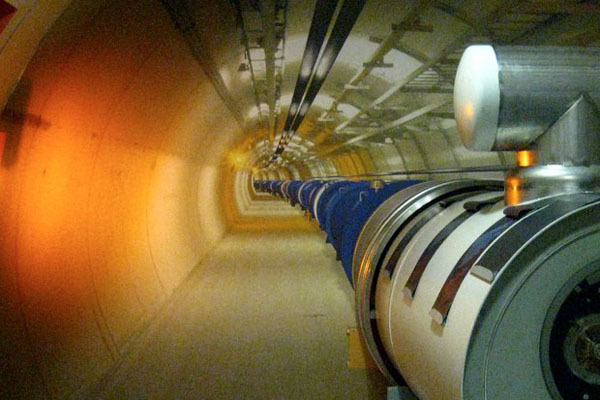 large hadron collider | Pleasant's Personal Blog! Chi_b (3P) – A New Member to The Particle Zoo! Since restarting operations in 2009, the Large Hadron Collider (LHC) situated in the Franco-Swiss border has made its first confirmed observation of a new particle. Titled Chi_b (3P) by physicists from UK, who worked on the ATLAS experiment, this particle could help scientists understand the fundamental forces better. The result is however still unpublished but is available in Arxiv pre-print server for reference. As explained before, the LHC is exploring some of the greatest questions in theoretical physics by creating the conditions of our early universe through proton-proton collisions. Prof. Roger Jones who works at the ATLAS detector explained that the Chi_b (3P) is an excited state or rather a heavier variant of the Chi particle, which was discovered about 25 years ago. Physicists James Walder said that though scientists had predicted Chi-b (3P)’s existence then, it was never seen until now. Just like the Higgs and photon, Chi_b (3P) is a boson, which means that it will carry some force and obey Bose-Einstein statistics. However, it is unlike Higgs in that it has an internal structure composed of relatively heavy particles viz. beauty quark (also known as bottom quark) and its antiquark, explains Prof. Jones. The quarks that build protons, neutrons and other hadrons come in six flavors viz. up, down, strange, charm, top and bottom. An interesting aspect of this finding is what it tells us about the strong nuclear force (carried by gluons) that binds both the quarks together. The measurements made in this machine tests theoretical calculations of the forces and discoveries of new particles such as Chi_b (3P), takes us closer to achieving a fuller understanding of the structure of our universe and cementing our views about how it is held together. This particle’s discovery is particularly important since once we better understand the strong force, we could explain the thing happening in the background of the collisions where we are currently looking for the Higgs. According to Prof. Paul Newman of the University of Birmingham, this marks the first time a new particle has been discovered in the LHC and that it is proof that the machine ran successfully in 2011. Andy Chisholm, a PhD student at Birmingham, who worked on the analysis team, added that the analysis of billions of these particle collisions is fascinating because of the potentially interesting things buried in the data. They were lucky this time since they looked at the right place in the mess at the right time. The LHC is expected to fill the gaps that exist in the Standard Model of Particle physics thereby opening horizons in new physics. The main aim for which the machine was built is to find the elusive Higgs boson; which, if exists could give satisfactory explanation of why matter has mass. That discovery could also throw more light on the workings of gravity, especially in the realm of unified field theories. The machine, which resides inside a 27 km ring-shaped tunnel, 175 meters below the ground fires streams of protons on opposite directions every day and produce billions of collisions. The beams are controlled by magnets and the carnage of the collisions that happen are recorded using detectors. It was only 10 days ago when scientists at CERN announced that they are pretty close to finding the Higgs boson and Chi_b (3P) could be a step closer to this goal. Amos, J. 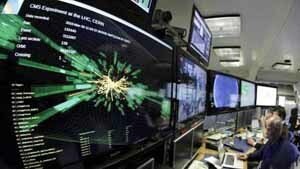 “LHC reports discovery of its first new particle.” BBC News – Science & Environment. Dec 22, 2011. http://www.bbc.co.uk/news/science-environment-16301908 (accessed Dec 23, 2011). 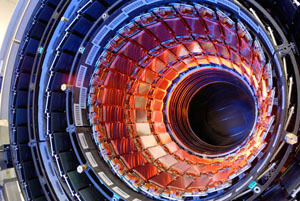 Brown, M. “Large Hadron Collider discovers a new particle: the Chi-b(3P).” Wired.co.uk. 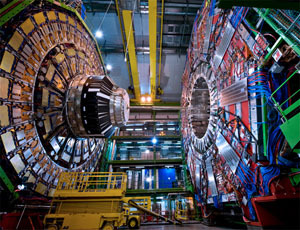 Dec 22, 2011. http://www.wired.co.uk/news/archive/2011-12/22/lhcs-first-new-particle (accessed Dec 23, 2011). Collaboration, The ATLAS. “Observation of a New Chi_b State in Radiative Transitions to Gamma (1S) and Gamma(2S) at ATLAS.” arxiv.org. Dec 21, 2011. http://arxiv.org/PS_cache/arxiv/pdf/1112/1112.5154v1.pdf (accessed Dec 23, 2011). 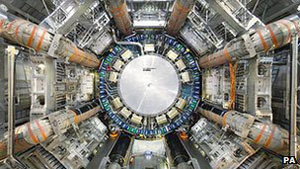 “Large Hadron Collider finds new variant of particle.” Dawn.com. 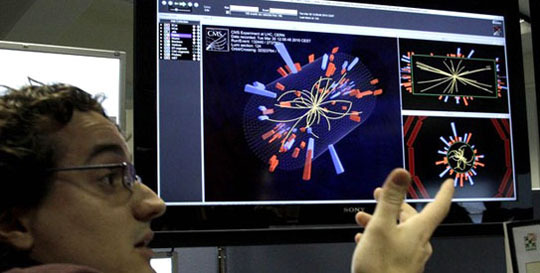 Dec 23, 2011. http://www.dawn.com/2011/12/23/large-hadron-collider-finds-new-variant-of-particle.html (accessed Dec 23, 2011). The Higgs Boson – Why bother? It is often one of the questions raised in both scientific and religious sectors. Why bother about the Higgs Boson or in common language, the God particle? Is it worth all the money and technology spent to find a particle that may or may not exist? It was a few years ago, that an American named Elizabeth Hershkovitz who shared my interests in cosmology and particle physics mentioned the Higgs Boson. Our conversation caught me seriously thinking about it. The Large Hadron Collider at CERN has been in news for the past few months since the claim of the discovery of faster than light neutrinos that allegedly emanated from it. Last week, the noise increased even more with some strong indicators of the presence of the Higgs Boson in both the ATLAS and CMS experiments. It is speculated that very soon a 50-year-old quest will come to an end when more data pours in from the two experiments. Nobody wondered why anything would have mass up until early 1960s when Peter Higgs, Philip Warren Anderson, Robert Brout, Francois Englert, Gerald Guralnik, C. R. Hagen and Tom Kibble proposed the famous Higgs Mechanism, laying the theoretical framework for the massive experiments conducted at CERN today. This mechanism has close resemblance to Yoichiro Nambu’s work on vacuum structure of quantum fields in superconductivity and also the Stueckelberg Mechanism studied by Ernst Stueckelberg. It was discovered that when a gauge theory combines with an additional field breaking the symmetry group spontaneously, gauge bosons acquired finite mass consistently. Despite the large values involved, it allowed a gauge theory description of the weak force, developed independently in 1967 by Steven Weinberg and Abdus Salam. Though originally rejected, Higgs’s paper was resubmitted to Physical Review Letters, with an additional sentence on the existence of massive scalar bosons which eventually came to be known as Higgs bosons. Let me first make sense of all these jargons. Particles roughly fall under two categories viz. fermions and bosons depending on whether they form matter or carry force. The fermions are themselves divided into hadrons and leptons based on whether they interact using the strong or weak force. Further, the hadrons are divided into baryons and mesons according to their quark structure. A gauge is a special coordinate system that varies based on a particle’s location with respect to a base space or a parameter space and a change of coordinates applied to every such location in that system is called a gauge transform. A gauge theory is a mathematical model of a system to which gauge transforms are applied. Usually these are gauge invariant, meaning all physically meaningful quantities are either left unchanged or transform naturally under gauge transformations. Symmetry breaking is a phenomenon in physics where infinitesimally small fluctuations acting on a system that cross a critical point decide the system’s fate based on the branch of bifurcation taken. It is used extensively in string theory and other allied theories to explain the initial conditions of our early universe. Scientists such as Higgs calculated that when particles interact with a field that permeates space called Higgs Field, they acquire mass. As mentioned earlier, this concept was required to explain the electroweak symmetry breaking that separates the electroweak interaction into electromagnetism and weak nuclear force where, after the breakage, some part of the left over mathematics manifests itself as the Higgs boson. For those who did not understand the tough words described, the mechanism can be thought of as tantamount to the famous “celebrity and mob” example. In a room, where people are evenly distributed, the entrance of a celebrity would change everything. People will try to flock around her and when she moves, the crowd would move along with her making her motion difficult. The workings of the Higgs mechanism can be thought of as something very similar to this. The universe contains the Higgs field at all places and any particle put in this field would interact with it. And the effect of this interaction is what we feel as mass. Simply speaking, the Higgs boson is supposed to be responsible for giving matter, its mass. The current excitement at CERN is because of relatively identical results from two separate experiments in LHC. The bar is set very high on the proof of the existence of Higgs boson and only 1 chance in 3.5 million is allowed to be wrong. And the identical results from two different experiments might be indicative that we are getting pretty close. It reminds me of John Schwarz and Michael Greene’s calculations on a night in 1984 when they were eliminating the anomalies in string theory. There was thunder and lightning outside and Greene said jokingly, “The Gods are trying to prevent us from completing this calculation”. It was a metaphor about Gods becoming upset when humans get closer to solving the mystery they created for them. Here again I drill down to the bedrock of the question I asked in the beginning. Why should we bother about Higgs and spend all that money on these massive LHC experiments? It goes without saying that there is an awe inspiring effect when new discoveries in physics and astronomy are made. I see physicists with utmost reverence since they allow us to see through the reality that makes us and everything around us. The Higgs, if discovered, would complete the fundamental theory of particle physics called the Standard Model, which currently consists of 17 particles and 3 fundamental forces. The fourth force viz. gravity is explained by Einstein’s General Theory of Relativity. String Theory, Loop Quantum Gravity etc. attempt at unifying both the standard model and general relativity but I think that is the subject of another article. Once complete, physicists can use the standard model as a foundation for something called supersymmetry which predicts heavier sister particles for the already discovered ones. 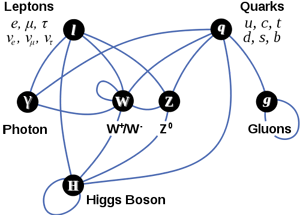 It states that for every fermion, there will be a corresponding boson and vice versa. For instance, an electron might have a supersymmetric partner called “selectron” while the photon will have its supersymmetric partner called a “photino” etc. The mass of these supersymmetric partner particles will again depend on the mass of Higgs itself. Currently, the results pouring from LHC indicates that it is light enough for the occurrence of some of these particles in these experiments. Scientists are also excited by the fact that they can now start looking for the building blocks for supersymmetry as well and see whether they fit the predictions too. Gravitational physics, the crossover between particle physics and cosmology, requires explanation for the mysterious dark matter. And mathematics suggests that the lightest of these supersymmetric partner particles make up the dark matter that hold the galaxies together. The most fascinating aspect of mathematical physics is its consistency and predictability. We can create equations to explain current observations and make predictions about the unknown based on the current equations. And history is witness for continuing success and occasional failures of such mathematical models. And those that fail become foundations for more successful theories. Not just in physics, but also in other branches of study this has been going on. Newton, Maxwell, Einstein, Dirac etc. are examples of highly successful theoreticians whose mathematical predictions exactly matched with experiments and observations giving birth to modern science as we know it. Famous physicist Eugene Wigner, one of the founding fathers of supersymmetry has stated this phenomenon as the “unreasonable effectiveness of mathematics”. Whether Higgs Boson is a “God Particle”, is a multifarious question. People belonging to religious sectors might see God’s hand in all the predictability of mathematics that has led science to where it is today. Others like me prefer to think that every discovery in science converges into how the universe began through quantum fluctuations in a pre-existing nothingness which is clearly indicated in the mathematics of several scientists including the recent works of Edward Witten and Lawrence Krauss. We need to understand that nothingness itself has certain properties because of which universes can indeed be created spontaneously out of nothing without any recourse to a supernatural creator. The Higgs boson, to the common man would sound like the figment of imagination of a group of elite geniuses that doesn’t have anything to do with his everyday life. However, when we look at science, historically there have been many examples where a completely “alien looking” theory became used on a daily basis. Here I would like to use the example of the application of general relativity in satellite navigation that gives GPS the pinpoint accuracy it requires. Czajka, A., Mrowczynski, S. “Collective Excitations of Supersymmetric Plasma.” Arxiv.org. Nov 28, 2010. http://arxiv.org/abs/1011.6028 (accessed Dec 17, 2011). Economist, The. “Higgs ahoy! The elusive boson has probably been found. That is a triumph for the predictive power of physics.” The Economist. Dec 17, 2011. http://www.economist.com/node/21541825?fsrc=scn/fb/wl/ar/higgsahoy (accessed Dec 17, 2011). Gardne, E.K. “Purdue physicists pursue Higgs boson; part of international CMS experiment.” Purdue University – University News Service. Dec 16, 2011. http://www.purdue.edu/newsroom/general/2011/111216BortolettoCMS.html (accessed Dec 17, 2011). Gerson, M. “The search for the God particle goes beyond mere physics.” The Washington Post. 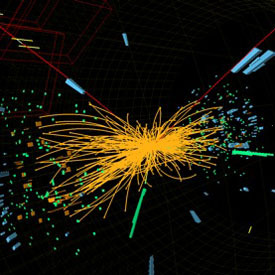 Dec 16, 2011. http://www.washingtonpost.com/opinions/the-search-for-the-god-particle-goes-beyond-mere-physics/2011/12/15/gIQAyIEzwO_story.html (accessed Dec 17, 2011). Halliday, D., Resnick, R., Walker, J. “Quarks, Leptons, and the Big Bang – A Summing Up.” In Fundamentals of Physics, by D., Resnick, R., Walker, J. Halliday, 1138. Singapore: John Wiley & Sons (Asia) Pte.Ltd, 2001. Higgs, P. “A Brief History of the Higgs Mechanism.” The University of Edinburg – School of Physics and Astronomy. 2011. http://www2.ph.ed.ac.uk/peter-higgs/history.shtml (accessed Dec 17, 2011). Reucroft, S. “What exactly is the Higgs boson? Have physicists proved that it really exists?” Scientific American. Oct 21, 1999. http://www.scientificamerican.com/article.cfm?id=what-exactly-is-the-higgs (accessed Dec 17, 2011). Ridley, M. “Inexplicable Particle: Why Even I’m a Higgs Bozo.” Wall Street Journal. Dec 17, 2011. http://online.wsj.com/article/SB10001424052970203430404577094400690586134.html (accessed Dec 17, 2011). Tao, T. “What is a gauge?” What’s new. Sep 27, 2008. http://terrytao.wordpress.com/2008/09/27/what-is-a-gauge/ (accessed Dec 17, 2011).